Ivy Taylor was appointed mayor after promising she wouldn't run to keep the job. She did anyway, beat a state senator in 2015 and now faces 13 challengers in Saturday's election — including current and former city council members. San Antonio Mayor Ivy Taylor is looking to fend off two serious challengers Saturday in the race for the top job in Texas' second largest city — the banner contest in municipal elections across the state. 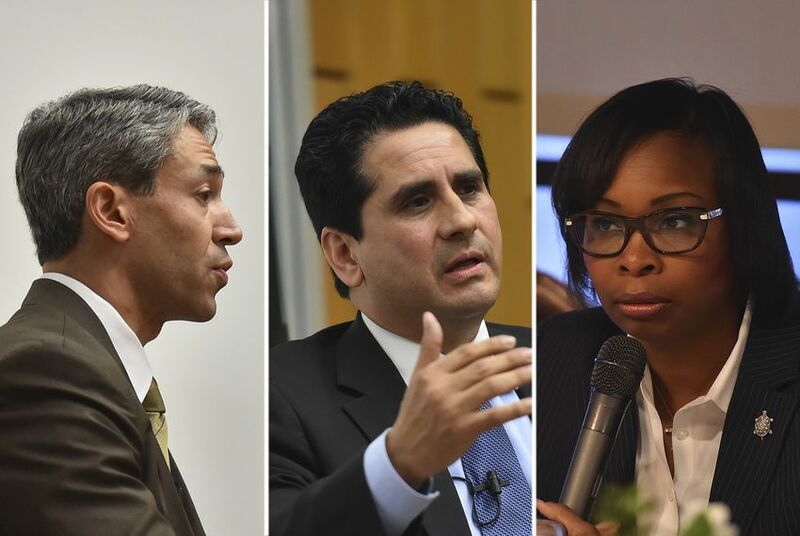 Taylor, the unlikely permanent successor to Julían Castro, is up against Ron Nirenberg, a city council member running as a policy-minded centrist, and Manuel Medina, chairman of the Bexar County Democratic Party, whose populist style has echoes of President Donald Trump. It's a nonpartisan election, but the race is fraught with politics as each candidate seeks to stitch together a winning coalition in the largely Democratic city. With days to go, attention has centered on whether Taylor can avoid a runoff — she would need over half the vote Saturday, when 14 total candidates are on the mayoral ballot — and if she does not, whether she will draw Medina or Nirenberg in the second round. Both say they are on track to make a runoff against her, though there has been no public polling to give an indication either way. "Given that there's 14 candidates in the field, the chances of ending up in a runoff seem likely, but we're doing all we can to avoid that scenario," Taylor campaign manager Christian Anderson said Wednesday. Taylor, a former city council member, ascended to the mayorship in 2014 after Castro left San Antonio to become the U.S. housing secretary. Her council colleagues picked her to finish Castro's term, partly based on the promise she would not run for the job a year later. But she did — and narrowly defeated then-state Sen. Leticia Van de Putte in a race that set off some soul-searching among San Antonio Democrats. Taylor has since settled into the office and won over some of her opponents in the 2015 battle, including Van de Putte, now a lobbyist. In September of last year — long before either Medina or Nirenberg announced their campaigns — Van de Putte endorsed Taylor for re-election, reportedly saying at a private fundraiser that the "voters got it right" in 2015. Among Taylor's first-term achievements: negotiating a long-awaited contract between the city and its police union, ending a dispute that was a major issue in the 2015 race. She also spearheaded SA Tomorrow, a plan to manage the city's growth over the next two decades that city council approved last year. Henry Flores, a political science professor at St. Mary's University, said Taylor has had a "stable record" since the 2015 election. "Generally, San Antonio's been in a good place," he said. "You could really make a point that we don't need to change anything at this point." Just "good" is not good enough for Nirenberg, who argues Taylor has not done all she can to maximize the city's potential. He is pitching himself as better equipped to turn the city into a "21st-century international metropolis," especially when it comes to growing pains the city faces regarding transportation, water and jobs. "This city under Mayor Castro had tangible momentum, was known as a city on the rise, and under Mayor Taylor, that momentum has gone," Nirenberg said in an interview. "The very key difference between us is I have a bold vision for the future and I'm willing to risk political capital to get things done." Taylor, on the other hand, has "passed the buck," he said. Nirenberg is also calling for ethics reform at City Hall, saying San Antonio is "trending backward with regard to public trust." He was one of two dissenting votes last year when the City Council approved what amounted to a retroactive waiver of ethics violations Taylor incurred when she first became mayor. Medina offers an even more critical case against Taylor, decrying what he calls a "pay-to-play culture at City Hall that benefits special interests against the people's interests." Medina's campaign has drawn comparisons to that of Trump, with its anti-establishment flavor and sharp jabs at the media — he led a protest outside the San Antonio Express-News last month after it ran a column casting doubt on whether he has lived in the United States as long as he has claimed to. "Democrats and Republicans are coming together to challenge the status quo, kick out the career politicians and drain the local swamp," Medina said in an interview Wednesday, co-opting Trump's promise to "drain the swamp" in Washington, D.C.
Medina has made strange bedfellows in his campaign, particularly as he emphasizes fiscal responsibility in city government. For example, he's thrown his support behind the GOP-championed Senate Bill 2, which would further limit cities' ability to raise property tax revenue without voter approval. That's earned him a list of endorsers that ranges from the San Antonio Progressive Alliance to Jeff Judson, the local conservative activist who unsuccessfully challenged House Speaker Joe Straus, R-San Antonio, last year. "This election is really more about the establishment versus the anti-establishment candidate, not so much Democrat vs. Republican," said Judson, who has previously supported Taylor. "Manuel is an anti-establishment Democrat, and that's kind of a uniting base. It shares a lot in common with the Trump theme as well — a lot of Trump voters are taking a second look at Manuel Medina for that reason." The race has been unfolding in the shadow of the comparatively action-packed legislative session in Austin. There has been some interplay, though, with Medina backing SB 2 and the leading candidates occasionally fielding questions on the "bathroom bill," which would restrict access to restrooms for transgender people in some public places. All three are against the proposal, including Taylor, whose 2013 vote against the city's nondiscrimination ordinance initially endeared her to social conservatives. Her faith has nonetheless emerged as a flashpoint in the current race, especially after a video clip surfaced last month showing her response to a question at a forum about the causes of poverty. She attributed it to "broken people" who are not "in a relationship with their creator." After the clip went viral, gaining national attention, she said it had been misleadingly edited but acknowledged she could have "expressed myself more clearly in explaining my belief." It remains to be seen whether the episode damaged her in the home stretch, but her supporters remain confident a win is in sight. Even some of her onetime critics say she has become a savvy operator at City Hall, fully growing into the permanent job she once denied having any interest in. "The mayor's style has people underestimating the mayor's prowess," said Colin Strother, a San Antonio political consultant who worked against Taylor in 2015 but now supports her. "She's not loud, she's not that used car salesman. She speaks softly and carries a big stick." "I can tell you," Strother added, "she's good at this job." Disclosure: Ron Nirenberg and St. Mary's University have been financial supporters of The Texas Tribune. A complete list of Tribune donors and sponsors is available here.